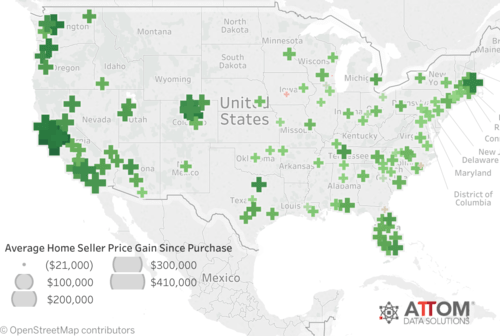 If you’re wondering if it’s a good time to sell a house, look no further than the ATTOM Data Solutions report released last week. The company’s Q2 2017 U.S. Home Sales Report found that the average price gain for home sellers during the second quarter was $51,000, the highest number since the second quarter of 2007. If you recall, home prices were flying high a decade ago, so it looks as if we’re back in familiar territory, minus that pesky housing bubble. Back then, the average gain was $57,000. Hopefully that won’t surface for another decade, but there are renewed fears with home prices hitting new nominal highs across the country and putting a strain on affordability. Some say a home is a terrible investment, but recent sellers managed a healthy 26% gain, on average, which sounds pretty good to me. That’s the highest it’s been since the third quarter of 2007, when it was 27%. Of course, it depends how ATTOM defines that gain. I checked out their methodology and they say the difference between the median sales price of homes in a given market from purchase to sale. If we drill down a bit further, it might not be as amazing as it looks. It costs a lot of money sell a home, though disruptors like Redfin Now are trying to change that. Once you factor in the 5-6% sales commission, along with other seller closing costs, then throw in relocation costs, any home improvements that were made, etc., the actual gain might not be so hot. However, these costs are always present, so relatively speaking it’s a great time to be a home seller. There’s just one little caveat. Sure, they can sell today and probably lock-in a solid profit seeing that it’s the most profitable time to unload a home in a decade. But where the heck will they go? Unless they have a second home waiting in the wings, it’s a tricky market out there. In fact, I wouldn’t wish the current housing market on my worst enemy. It’s brutal, there are very few homes for sale, and those that are available are generally overpriced, not attractive for some reason, or scooped up in what seems like hours to someone willing to offer more than you. It’s so bad these days that I would almost add “not actively looking to buy a home” to the list of pros of homeownership. 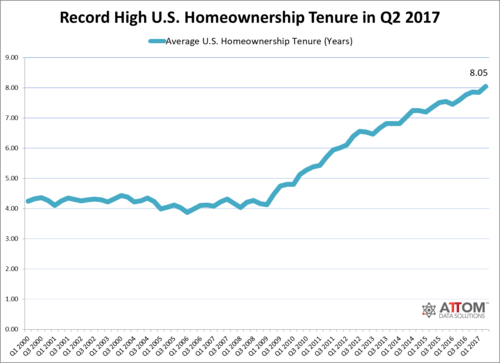 Anyway, this rather odd dynamic explains why homeowners who sold during the second quarter had owned their homes for an average of 8.05 years, which is the longest tenure ever recorded by ATTOM (data goes back to Q1 2000). That number was up from 7.85 years in the previous quarter and 7.59 years a year earlier. However, I expect it to fall as recent buyers sell off big winners. We’re seeing a lot of sellers finally parting ways with homes they were unable to sell, either because they are no longer in negative equity positions or because they’re retiring and see today as a good exit point after a rocky decade. If you’re curious who’s making the most, it is home sellers in San Jose, California. There, the average return was a staggering 75% in Q2. Sounds frothy. It was followed by San Francisco, California (65%), Seattle, Washington (63%), Modesto, California (62%), and Denver, Colorado (62%). The list is mostly unsurprising, given the big names and their proximity to big tech companies. The only outlier is Modesto, a city in central-California that was actually really hard-hit during the housing crisis. Somehow prices are booming there. I guess it’s only about a two-hour drive to San Francisco or Palo Alto, which might make it attractive to some who are priced out. For the record, distressed sales, which include bank-owned REO, third-party foreclosure auctions, and short sales, accounted for just 13.4% of all home sales during the second quarter, down from 17.1% in the first quarter and 15.2% a year earlier, the lowest percentage since Q3 2007.